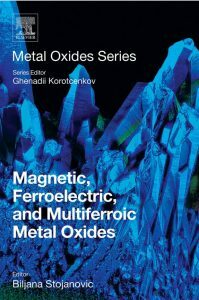 Magnetic, Ferroelectric, and Multiferroic Metal Oxides covers the fundamental and theoretical aspects of ferroics and magnetoelectrics, their properties, and important technological applications, serving as the most comprehensive, up-to-date reference on the subject. Organized in four parts, Dr. Biljana Stojanovic leads expert contributors in providing the context to understand the material (Part I: Introduction), the theoretical and practical aspects of ferroelectrics (Part II: Ferroelectrics: From Theory, Structure and Preparation to Application), magnetic metal oxides (Part III: Magnetic Oxides: Ferromagnetics, Antiferromagnetics and Ferrimagnetics), multiferroics (Part IV: Multiferroic Metal Oxides) and future directions in research and application (Part V: Future of Metal Oxide Ferroics and Multiferroics). As ferroelectric materials are used to make capacitors with high dielectric constant, transducers, and actuators, and in sensors, read heads, and memories based on giant magnetoresistive effects, this book will provide an ideal source for the most updated information. The book contains several chapters devoted to Lead-Free ferroelectrics. Our Chapter 9 on “Ecological, Lead-Free, Ferroelectrics”, by L. Pardo, M.E. Villafuerte-Castrejón, E. Morán, A. Reyes-Montero, R. Vivar-Ocampo and A. M. González, is now avaliable on request.